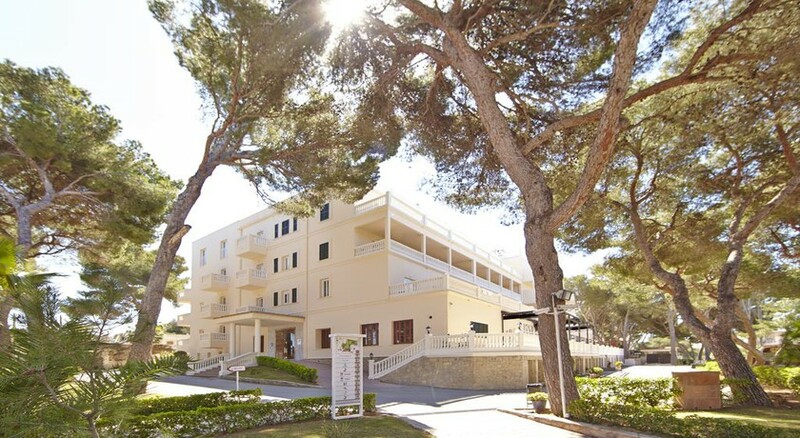 Located just 500m from the beach, the 3 Star Palma Bay Club Resort is the perfect hotel for those looking to sample a real taste of Majorca. The hotel is beautifully designed and set in stunning gardens with four swimming pool areas, providing guests with plenty of space to embrace the gorgeous sunshine. The Palma Bay Club Resort has plenty of restaurants to choose from and entertainment that is perfect for people of all ages. Whether guests are looking for an active holiday or one where they can simply lie back and relax, this hotel has it all covered. 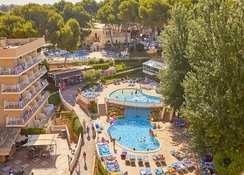 From Arenal Beach just a few hundred metres away to the capital of Majorca, Palma located 11km away, the Palma Bay Club Resort benefits from the perfect location. For those who like to explore, there are restaurant, shops and bars just a short walk away and for those who want to embrace some adventure, there is a wide selection of water sports available on the beach. The complex provides guests with the chance to make their holiday experience their own from the Palma Aquarium for the kids to a selection of stunning churches for those who like to explore, the location is ideal for families and couples alike and what's more, Palma de Mallorca Airport is a short, 11km drive away. 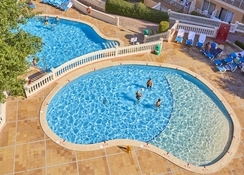 Palma Bay Club Resort offers spacious yet simple accommodation for all, offering Single, Double and Triple rooms. The rooms have been neatly designed and they all deliver a bright and airy feel, ensuring that guests can really relax and make the most of the facilities on offer. All rooms come with satellite TV, air conditioning, WiFi, telephone and safe deposit box. The rooms are also equipped with bathrooms with a shower, hairdryer and complimentary toiletries. For families staying a the hotel, there are family rooms where an extra bed and crib are available on request. As far as food and drink go, the Palma Bay Club Resort offers guests a wide selection of options. The main restaurant is buffet style and this is where breakfast and lunch are served before a choice of dishes are served for dinner in the evening. The live cooking station and themed nights give guests the chance to explore new tastes while the selection of alcoholic and soft drinks are ideal for young and old. For guests who want to break up their holiday with something different, there is a grill restaurant, pizzeria and Oriental restaurant on offer, all of which have to be booked in advance. A relaxing drink can be found at one of the three indoor bars or the two outdoor bars, providing plenty of choice for guests. As far as entertainment goes, the Palma Bay Club Resort has it all. The outdoor swimming pools provide guests with the perfect place to cool off or have a leisurely swim. For those who want something more, there is plenty of entertainment on offer such as tennis, mini golf and volleyball while kids can find plenty on offer in the game arcade. The fitness centre is the perfect place to burn off some energy while the kids play in the mini club while night animation and day entertainment ensure that everyone gets to have some fun and excitement during their stay. The hotel is in close proximity to the beach at just a few hundred metres and with restaurants, shops and water sports available, there is something for everyone. Had a fantastic holiday here, food and drinks was great, kids loved it. We want to go back again. Excellent all round, we have been two years running now and it has been excellent, best family Holliday ever and great entertainment. We had an amazing time. Staff was very helpful and friendly. Will deffinately recommend this place. It was ok. The rooms are of a decent standard. The only problem I have is that when we arrived we got booked into a shoe-box sized room with no balcony and it wasn’t till next day when we got a better accommodation. We also had to sleep in un-made beds in the second night but it’s ok for that area/type of holiday.